Free ski pass for the largest, ski area that is fully equipped with machines producing artificial snow with the Imberg cable car and the ski arena in Steibis : free ascent and descent to unlimited winter hikes, sledging and sunbathing with rustic huts serving food and refreshments. Free ski pass for the longest downhill run in Oberstaufen with the Hochgrat cable car : free ascent and descent to the unique panoramic view of the mountain summits and an altitude of 1.800 metres invites you to sunbathe, relax and stop for refreshments. The sunset rides and full moon rides are included. Free ski pass for the family friendly ski area Hündle / Thalkirchdorf: including floodlit skiing in Thalkirchdorf and free ascent and descent with the Hündle cable car for winter hiking or a rustic snack in an alpine hut. Panoramic swimming arena Aquaria : free entry with bathing fun and well-being activities in all weathers. An outdoor pool, sports pool, warm water pool, 100 metre long water slide and a large sauna area await you. Free ski pass for the ski lift at Sinswang : the ski area is ideal for the little ones or beginners. Free rides with the shuttle bus in Oberstaufen in the town centre as well as from the town centre to Steibis and to the Imberg cable car and Hochgrat cable car and to Immenstadt. Ice rink Oberstaufen: unlimited use of the ice rink in Staufen Park “Kurpark” Oberstaufen for ice-skating and curling. Local History Museum in Oberstaufen: free entry to the local history museum “Beim Strumpfar” – experience and find out about the history and the every day life of times gone by. Free parking on nine of the public car parking areas in Oberstaufen – you will receive a ticket for the maximum parking time at the car park ticket machine. Nutritional advice: free entry to the nutritional advice lectures in the Färberhaus . 5 per cent discount in restaurants, cafes and bars as well as in retail outlets. gregor › Dear, how can I get winter card for my family. I already booked a hotel in your area. Maria Heim › Dear Gregor, great to have you here soon. You'll receive the Oberstaufen PLUS guestcard automatically during your stay, if your host is part of this partnership. Currently there are over 300 hosts, recognizable by the orange PLUS symbol. Which host did you choose? Carlos La Bandera › I want to know if my family and I need a Plus card for Oberstaufen. We do not ski. Only want to play with the snow and walk around. We have reservations in an RCI hotel. Bianca Keybach › With the card you can also enjoy several attractions like free parcing, free entrances in our adventure pool and the museums, using our cable cars etc. Have a great holiday in our region. Maria Heim › Hi Richard, great to have you here soon - when will you arrive? The Oberstaufen PLUS guest card is offered in over 300 hotels, apartments and guesthouses. Unfortunately the hotel "Allgäu Sonne" is not part of this program. Here you'll find a list of all hosts, which are offering this guest card. 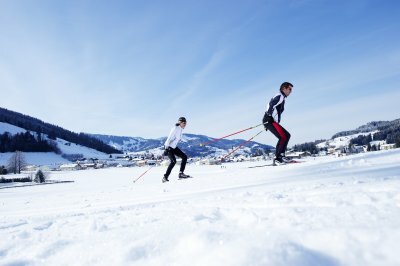 But your regular guest card "Allgäu Walser Card" is offering you reductions for various activities in the region - find more information here. If there is anything else, I can do for you, please just let me know. Richard webb › Thank you Maria for the quick and detailed answer. Is there anyway you can find out about the winter sledging in the area (1) is it only on a Saturday its floodlit (2) is it easy to hire sledges please (3) where would you say is the best for family winter sledging around xmas time in the area . Thank you again Ps how much is oberstaufen pass to buy for 5 days for a family please. Maria Heim › Hi Richard, I am happy to help you! During the day you can go sledging at Hochgrat and Imberg. There it is super easy to rent a sledge. Additionally on saturday evening there is floodlight at the Imbergbahn - please inform yourself upfront, if it really takes place (call +49 8386 8112 for that). If there is enough snow at Christmas both places are great for your family adventures. Unfortunately you cannot buy the Oberstaufen PLUS guest card, you'll only get it, if you'll stay at a host, who is part of this program. Daan › ..and in addition to my previous question - I assume you can use all the ski lifts in a certain area for free, for the entire day? Bianca Keybach › Hi Daan, thank you for the message. We´re looking forward to having you here for the perfect winterholiday ;-) As you booked an Oberstaufen PLUS hotel, you can enjoy our skiing areas for free. Each day of your holiday you can chose one of the four areas the entire day. The Imbergbahn/Skiarena Steibis is the biggest and most popular one. The Hündle-Thalkirchdorf-Area is also often recommended. You can visit different areas with the same card - just not at the same day. After you made your choice for one day, the next day you can choose again and differently than the day before. Also our adventure pool Aquaria is a "top-partner" as our four ski-areas. So if you go there without paying entrance, you can use the skiarea for free the next day. All the other offers (free parking, free bus, free WLAN, entrance in museums, using the ice scating area etc.) are unlimeted free. If you have further questions, just let us know. Molly Cook › We are booked to stay December 23-30 at the Mondi Holiday Resort, how do we find out about these activities and how to access them? Looking to plan our days for Oberstaufen Holiday.